Our Blue Number Balloons give your event a touch of stylish sapphire! These metallic balloons come in every number from zero to nine so you can combine them to make any number. Assemble a special age, number or year for a birthday, graduation, anniversary, New Year's Eve party or fundraising event! In a versatile hue that complements a variety of party themes, our Blue Number Balloons can be mix and matched with other round balloons, shaped balloons and even latex balloons for a custom balloon arrangement. Balloon weights, curling ribbons and balloon lights add the perfect finishing touches. Don't forget the helium! 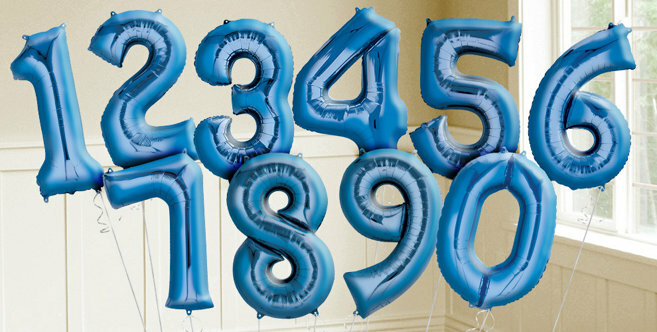 Shop all of our Blue Number Balloons and balloon accessories below!